With more than a dozen years of experience as an author, magazine journalist, and historian, Garrett Graff presents a talk on the ongoing investigation into the alleged collusion between the Trump administration and Russia. » SEE ALSO: Garrett Graff's interview with WGBH News. 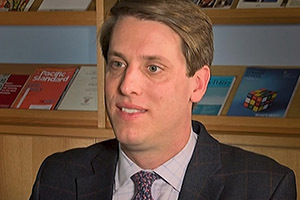 Author, magazine journalist, and historian Garrett Graff is the director of the Aspen Institute’s cybersecurity and technology program. He has written multiple books on politics, technology, and national security and contributed to Esquire and the New York Times. Graff has served as editor for Washingtonian and POLITICO Magazine. His most recent book was published in May 2017 and presents the story of the government's Cold War Doomsday plans.